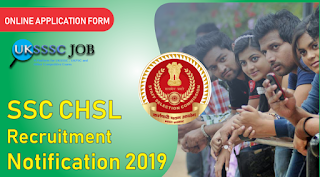 SSC CHSL Recruitment 2019 Notification:-The Staff Selection Commission (SSC) is an autonomous organization that conducts several exams every year for the recruitment of various posts in various departments, offices, and ministries of Government of India. SSC CHSL Tier 1 exams to commence from 1st July to 26th July 2019. SSC CHSL Recruitment 2019 SSC 10+2 Recruitment 2018-19 for vacancy Posts of Postal Assistants & DEO, LDC SSC CHSL exam 2019 ssc chsl 2018 Online Application form 10+2 Combined Higher Secondary Level Exam 2019. Aspirants who are looking for Latest Govt Job Notification 2019 may apply for the posts. The tentative exam schedule for the SSC CHSL Recruitment 2019 exam is mentioned below. SSC CHSL 2019 Tier 1 exam will be held online . in tier 2 there will be a Descriptive paper of 100 marks within 60 minutes in pen and paper mode. There is reduction in time limit for examination of Tier -I from 120 minutes to 75 minutes. There is no change in Tier III. This Tier has a descriptive exam which is designed to test the written skills of the students in English/Hindi. The Paper would have an essay to be written in 200-250 words and Letter/Application writing of approximately 150-200 words. The minimum marks to qualify in Tier-II would be 33 per cent. The performance in Tier II would be incorporated for preparing merit. Duration of the exam is of 60 minutes’ caring 100 marks. The level of questions are based on 10th standard or higher secondary level. Duration of the exam is 80 minutes for candidates who are visually handicapped or suffer from cerebral palsy. Typing speed for Data Entry operator is 8,000 (eight thousand) with Key Depressions per hour on Computer. Typing Test will be held in English or Hindi and candidates while registering for the Examination, will have to mention his/her choice/option for Skill Test Medium in the Application Form. In this the typing Test will be of qualifying in nature. It will be managed on the Computer, to be provided by the Commission or any agency approved by the Commission. Candidates who opt for English medium should possess a typing speed of 35 words per minute. Candidates who opt for Hindi medium should have typing speed of 30 words per minute. The speed will be decided on the accuracy of typing on the Computer of a given text passage in 10 minutes. Visually Handicapped candidates (with 40% disability and above) will be given 30 minutes. Note: After conducting skill test or typing test, those candidates who qualify it, will be chosen based on their position in the merit list. Direct Link to Apply for SSC CHSL 2019 Application – Apply Now! First, begin to Register yourself carefully. A new Log In Id & Password will be created. Save the Id & Password for further reference. Fill up the form carefully. Alternatively, you can go to the Official Website.